Just yesterday we got a promotional email from Yatra.com that talked about a newly launched Travel Deals web site and how it is and we quote "a platform for the most lucrative and cost saving deals." But Yatra.com has always been providing offers and discounts on travel packages hence we wondered what's different this time. So what's different about it? First of all, it is not actually a separate web site rather the Yatra Travel Deals (aka Steal-a-Deal) is simply a new section within the Yatra.com portal. A user can access it through a link on the home page too. More importantly, the section has been around for a while (it was released in beta back in July this year) and it finally became live last month, hence the promotional mail. But why did the company decide to launch a new section in the first place, when we asked Akhil Gupta, VP, Group & Bulk Deals at Yatra Online Pvt Ltd he had this to say, "The primary objective of a dedicated travel deals section on Yatra.com is to give travellers access to last-minute deals on hotels, holidays and other travel products available with Yatra.com. The deals section is also a marketing platform for hotels and resorts that require a larger brand visibility in a very short span of time." 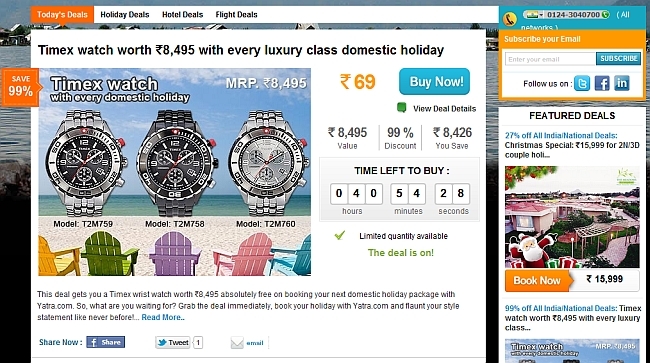 Gupta says the deals platform of Yatra.com is different from the regular promotions in terms of life-span of the offer and a typical deal on the new section is valid for 3-4 days or until it is sold out. "Moreover, a deal on a particular hotel or resort may not be available on our regular booking channels purely for the nature of the product. For example, a deal on camping in Rishikesh may not feature as a regular promotion due to season and time-bound nature of the product itself," he added. So what's new in this section, is a revamped user interface, simpler process of checkout, dedicated support team for deal buyers (we tried the helpline number and were instantly connected) and a better mix of deals including some which are otherwise currently only available as part of a holiday package. The company also claims that in the future it will offer exclusive deals (that won't be available on any other travel sites). Customers can subscribe to get the deals through an email (just like any other deal site). As far as traction goes, as of now the company lists 2-3 deals a day on pan-India basis and it claims that 95 per cent of the deals sell out within 4 days (holiday packages and flight deals are often sold out but deal coupons are the all time favourites among customers). What's next? "At the moment we are offering pan-India deals. In the coming weeks we will open up city wise deals also," concluded Gupta. Time for daily deal sites to pull up their socks.